The Amazon Echo Dot: I'll get straight to the point, for a change. Assuming you already own a speaker of some sort, you should probably buy one of these. My reservations about the full-size Amazon Echo, full of promise though it is, included that it wasn't amazing as a speaker for music, and it maybe felt a little over-priced. There's no way I could say the same about the much smaller Dot. Granted, its onboard speaker is barely audible but unlike Echo, it has a line out (3.5mm only), so you can plug it into whatever you like. I've tried it with everything from a Naim Mu-so Qb to an Urbanears Baggen to Bose's Revolve and the improvement in sound quality and volume over the Echo was marked in every case, as you'd expect. No, it's not the most audiophile of connections, but it still sounds better than the Echo. The Echo Dot is like the rotating portion of the full-sized Echo has been sawn off. It's about the size of an ice hockey puck. I think. I can't say I've ever actually seen an ice hockey puck in real life, but everyone says it is, so I'm going to go with it. It does have a little speaker, but it's just so Alexa, Amazon Echo's AI hostess with the mostest, is able to reply to you. In its raw form, you could use a Dot as a supplementary Alexa portal, in addition to an Echo. You wouldn't want to listen to music through it, unless perhaps you live in a monastery, and don't want the other monks to hear you listening to Cradle of Filth. Use the 3.5mm output to plug in a decent speaker, however, and the Dot instantly becomes "Echo But With Better Sound Quality". As such, it's able to be used anywhere in the house, while Echo's natural home remains the kitchenette. When you consider that this Echo But With Better Sound Quality will cost you just 50 quid, it becomes a must buy. Or if not a must buy, at least a "You might as well buy". I mean, seriously, what can you buy for £49.99 these days? That'll barely get you a big Toblerone. The sheer affordability of Echo Dot (assuming you already own a speaker which, if you're reading T3, surely you do) makes it easy to overlook the fact that, other than playing music and serving as a kitchen timer and to-do list maker, Alexa doesn't excel at a hell of a lot, so far. However, the new Amazon Music Unlimited streaming app (or 'Skill' to use the official Echo terminology) is undeniably fantastic. Spotify might not exactly be trembling, not least because its app – sorry, 'Skill' – works very well on Echo too, but it might be a little concerned. On Echo, Music Unlimited gives you 40 million tunes for just £3.99 per month. That, chums, is a DEAL. If you want to use it on other devices it's £7.99 (or an attractive £79 per year) for Amazon Prime subscribers (ie: the cost is on top of the usual £79 per year for Prime). Not a Prime user and want Music Unlimited on your mobile? That'll be a Spotify-style tenner a month, please. The great thing about Music Unlimited and the older, more limited, Amazon Prime service on Echo is the brilliant way it uses Alexa's voice recognition and cloud database mining skills. Tracks can be selected, favourited and skipped in all the usual ways, but thanks to the miracle of metadata you can also ask it for "happy 80s music" or "melancholic heavy metal" or even "Sad Abba tunes from the 70s". You can also ask for "That song that goes 'blah blah blah'," with lyrics allegedly available for "70-something per cent" of the 40 million tracks on offer. I have to say, I have never got this to work, but maybe that says something about the obscurity of my musical tastes. 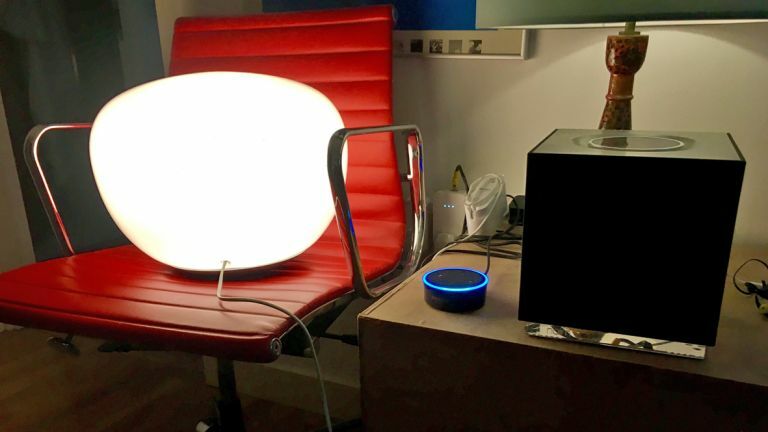 It's functionally identical to the full sized Echo, so when you then add Alexa's acknowledged skills with setting timers, making lists and turning your smart bulbs on and off, and I'd say any music lover has more than got their £49.99-plus-£3.99-per-month's worth. It's AI on the cheap, with a really good music service also at a giveaway price. Okay, I do have a few issues and quibbles about Alexa's efforts to understand you when you're asking for specific songs and albums. You can read about them, and get the full low-down on all Alexa's non-musical skills in the review of the full size Amazon Echo.